In the business of electric skateboards, the Halo Board Electric Skateboard certainly serves as an idol for the rest. What makes this product stand out is its stupendous performance? It is unique in so many ways and enjoys a dominating grip in the market. It has set some tremendous standards and whosoever has got the fruitful opportunity to witness it, is in awe of it. Through this article, I would like to give you an overview of this electric skateboard which has been rated the best of 2018. If you wish to purchase one, then I will certainly back your decision. This is something that gives a new definition to skating and your experiences with it will make you feel as if you are on cloud nine. Is Halo Board Worth the Cost? The biggest perk of this product is its design. Every detail has been taken care of, leaving no room for any sort of complaint. To be more specific, design of the deck is what leaves its users and viewers speechless. It is simple, yet futuristic. The 100% carbon fiber material, without any impurities accounts for the long durability of the product. For the user’s convenience, a handle is provided at the rear. The handle can be used to carry the skateboard without any need to pick it up. The 27 inches wheelbase is a perfect design aspect, considering the length of the deck, which is 36 inches. It has been designed to keep the weight as low as possible and the performance as high as possible. This is the perfect board for all sizes as the weight limit is 286 pounds. It is powered by a 3000-watt dual motor. Do I need to explain what a 3000-watt motor can do? Simply, it can do what the rest electric skateboards can’t do. It can reach up to a speed of 22 miles per hour (mph) and has a range of 12 miles. Probably, you can dismantle all your records that you have earned in skating. The remote control is a significant performance factor for an electric skateboard. Keeping this in mind, the manufacturer has provided an ‘Ergonomic Bluetooth Halo Remote’. It is one of the few products to have the Bluetooth feature. Need to climb up a hill? No worry. This skateboard has the tendency to climb up an inclined plane of maximum 14 degrees. One of the amazing things of this skateboard is its tendency to push for some time, even when the battery is dead. Safety comes first and here, you need to be relaxed as the Halo Board is one of the leaders in electric skateboards, when it comes to safety. The 83 mm halo street wheels – 78A collaborates well with all sorts of urban terrains and maintains top notch balance. Coming to the more sensitive electrical parts, the 7AH Certified Firesafe LG Lithium Ion Battery and the dual motors are dust and water proof and endorse your safety. For the very purpose of safety, it is strictly recommended that it should not be used by children below the age of 10. Else, all of you can try it out. It is priced at USD $1097, which is absolutely reasonable. It can’t get better. I can assure you that you will never worry of the money you spend on it as it will offer you priceless experiences. 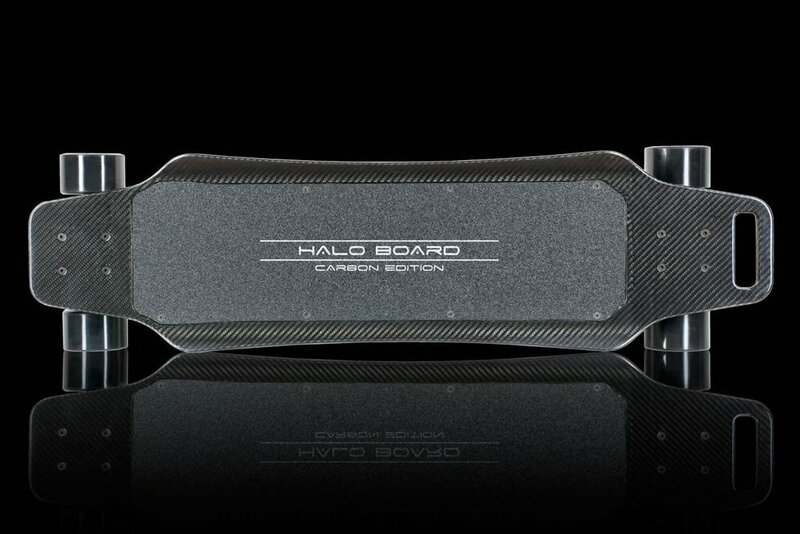 So, get yourself the ‘Halo Board Electric Skateboard’ and roll like a boss on the streets. I would like to conclude by stating that it has been rated the best electric skateboard in the market, which is enough to nullify the price effect.